ANXIOUS TIMES often drive investors to gold, and 2019 is already making good on its promise of trouble, writes Adrian Ash, director of research at BullionVault in this article first published at Portfolio Adviser. Worsening US-China relations and the West's increasingly febrile politics risk adding to the global economic slowdown. Central banks are however constrained from new stimulus, trapped between near-zero rates and a backlash against QE's distributional effects. So should absolute returns funds make a priority of reviewing gold as a portfolio hedge? Late 2018's stock-market slump certainly sent some managers into what news-wires and pundits insist on calling 'safe haven' gold. Bullion-backed ETP holdings jumped and speculative trading in gold futures and options turned bullish as the MSCI World Index suffered a 10% drop in December, its worst month since 2011. Physical allocations in London and Zurich vaults also rose according to our industry contacts. Altogether that took gold prices up to multi-month highs in Sterling as well as Euro and Dollar terms. But while gold's action around New Year showed again that bullion investing tends to jump when equities dive, it also suggests that many portfolio managers have taken the wrong lesson from gold's long bull market of a decade ago. That's because the global financial crisis proved so relentless, it let late-comers buy gold for insurance even after Lehman Brothers collapsed, and still show dramatic gains two, three and even five years later. Between 2007 and 2012 – from the first US subprime fail (OwnIt Mortgage Solutions) to the Federal Reserve's largest (and last) QE bond-buying program – gold beat equities in all but one year for UK portfolios. 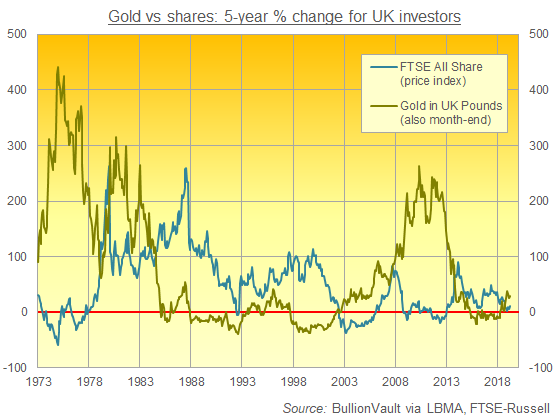 During the crisis as a whole gold prices rose 215% in Sterling terms as the FTSE All-Share lost 5%, dividends included. Across all 5-year periods in fact, shares beat gold only once between 2001 and 2012. Waiting for trouble to start, in other words, didn't stop a portfolio benefiting from gold's gains as first the Dotcom and then the Banking Crash hit. But it may be a mistake to assume that gold will prove so accommodating during the next downturn in stocks. On a monthly basis, trying to time a short-term position in gold as an equity hedge is no better than a coin toss. Over the last half-century, gold priced in Sterling rose in 54% of those months when the FTSE All Share rose (price index). It also rose in 54% of those months when equities fell. Gold's famous powers of diversification were hardly clearer on a 12-month horizon. Gold rose year-over-year 60% of the time when the FTAS rose, and it rose 67% of the time when equities fell. But on a 5-year horizon, and while gold rose 63% of the time when the stock market rose (again, looking at all month-end data), the metal gained fully 96% of the time when share prices fell from a half-decade before. Adding gold may seem simply wrong-headed for a long-term portfolio, because the metal pays no income. Nor can the buggiest 'gold bug' deny the metal performed poorly across the 1980s and especially late-1990s. But the fact that equities were then enjoying the 'long boom' of deregulation, globalization and falling interest rates actually supports the case for gold as a useful hedge, rather than undermining it. Because no one cancels their home insurance just because they didn't suffer theft or a fire. Protracted losses in equities are no small risk either. On a 5-year horizon, the FTSE All-Share has since 1968 traded lower one-fifth of the time. That is exactly as often (20%) as it has doubled or more. Historically at least, gold has performed just as headline-writers would wish, moving up when equities move down and helping reduce losses overall. Indeed, in 2008 – the worst single year for UK portfolios since the disaster of 1974 – holding just 5% in gold would have saved almost £3,000 on every £100,000 invested in a portfolio otherwise split 60:40 between equities and bonds. But the real benefit of unchanging, unyielding gold has come for those investors willing to take a longer-term position in the metal, holding it as a form of insurance rather than waiting to dash in only once the need for a 'safe haven' becomes so urgent it may well be too late.